Like last year, we have special (pre)X-Mas treats for you, in case you're looking for a good present for your metalhead friend... or maybe yourself. But this year we slashed the prices in half! Yep, that's right, if you order one of our 5 special genre-specific CD bundles, you'll pay just 50%! This offer lasts for 2 weeks only - ending on December 15th. Take a look at these genre-specific bundles in our SHOP... We've got classic HEAVY METAL covered with 6 CDs (and you can choose the titles you want in the case of BATTLERAGE, SKELATOR and SACRED GATE), then US POWER and POWER/THRASH with 6 CDs (one of them double! 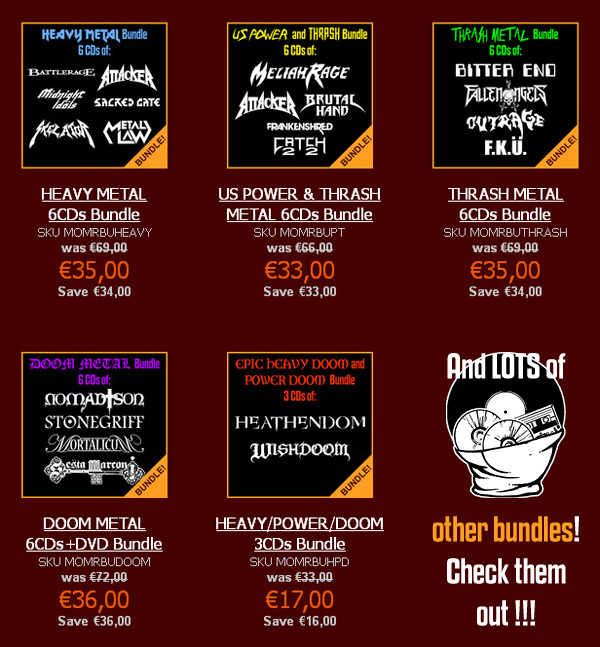 ), we have a more pure THRASH bundle, again with 6 CDs, a DOOM METAL bundle with 6 CDs (one of them including DVD), and finally an EPIC HEAVY/DOOM and POWER/DOOM bundle (this one with just 3 CDs). Apart from these 5 special bundles we've got other 29, so indulge!